If you are anything like me, you are always in search for the perfect snack. Something sweet, salty and satisfying that won't make you gain a ton of weight. I am VERY pleased to introduce you to the new Fisher Nut Exactly. They are Dark Chocolate snack bites that are the perfect combination of roasted almonds, whole grain popcorn and 64% cacao real dark chocolate. Yum. There are also NO artificial ingredients in these snack bites. These snack bites would be perfect for munching on while watching a movie, a quick snack on the go or even for hosting a house party. **TO ENTER- Enter using the Rafflecopter below. Note: It may take a moment for the Rafflecopter to load. If you are reading this via RSS or Email, please visit the website to enter** Giveaway is open to US Residents only. Giveaway ends 4/29/14. *Disclaimer: I received the same prize pack that I am giving away in exchange for this post. I was not compensated in any other way. All opinions are my own. I love that they are natural. I don't like buying food with GMO's and ingredients I can't pronounce. I really like the combination of chocolate and nuts. All natural is a bonus! I like nuts mixed with chocolate for snacks. Nuts are such a healthy and filling snack so I'd love to try it! It looks like a great snack. I love chocolate and adding the nuts and popcorn. yum! Just yum. Yum Yum Yum. WHY am I excited about this new snack? I blatantly will admit that it's because of the Chocolate! LOL Oh yes.. a perfect combo here. What an enticment to me. I'm excited because these sound delicious! And healthy--nuts,popcorn,and dark chocolate. I'm excited to try Fisher nuts because I know that they are a healthy and delicious snack. Love the idea of chocolate covered nuts. I am excited to try fisher nuts because I have always heard a lot of good things about them. I'm excited because I love to eat nuts. They are a delicious and healthy snack. I eat them all the time. I'm excited to try them because I think they'd be the perfect snack when I hit my mid day slump at work! I am excited to try it because I love chocolate and nuts. I love almonds and chocolate! Nut and chocolates are my favorite! I want to try them because I like chocolate. I love chocolate and I love nuts. The Fisher Nuts Exactly is a great combination of sweet and salty. I like that it has almonds, popcorn, and chocolate combined for the ultimate snack to satisfy multiple cravings. 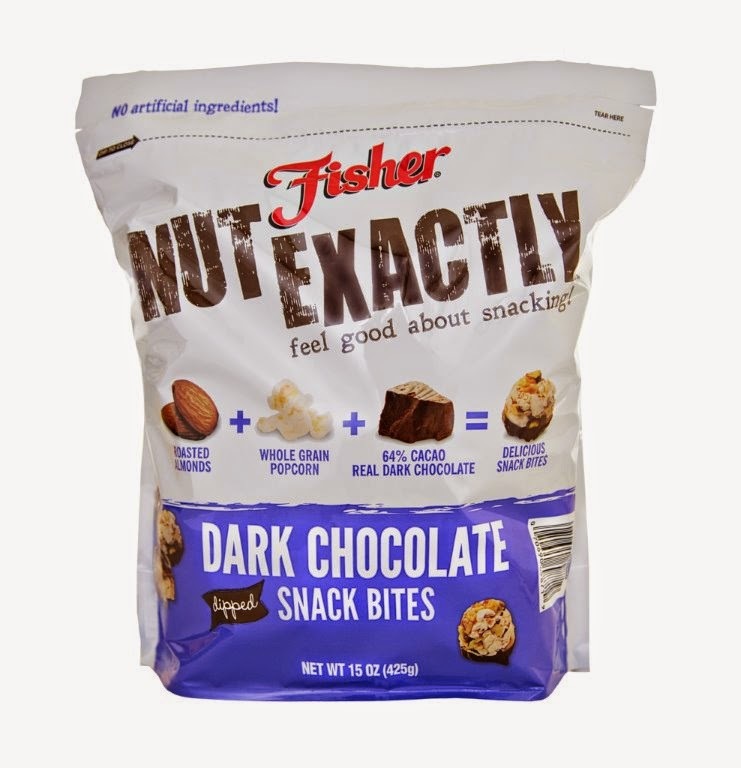 I want to try Fisher Nut Exactly because I am always looking for healthy snacks. I also like the name. Love puns! I want to try it because it's a healthy and delicious snack. I love any kinds of nuts and these have Dark chocolate too sounds great to me! I love chocolate and nut combinations; especially dark chocolate. I'm excited to try these because it combines 3 of the things i really like to eat. I have never tried them, and they seem like they would be a healthy snack. Thanks for the giveaway…looks like a tasty combination: almonds-dark chocolate-popcorn ...what's not to love in a snack like this one !!! 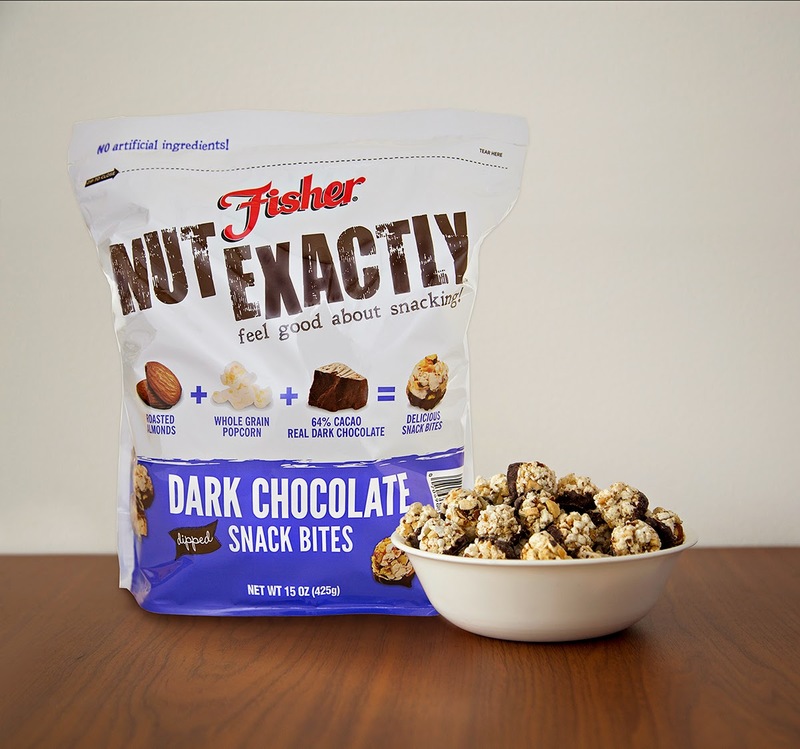 I'm excited to try Fisher Nuts Exactly because I need a new healthy snack to enjoy! The combinations sound delicious! One of my favorite snacks is nuts and then to have them with chocolate and popcorn-it just sounds so healthy and delicious! I am excited to try them because I think they are something my family would enjoy! I am excited because I love popcorn and almonds. Also chocolate. what a perfect combo. Sweet & salty! I am excited to try them because I love all the ingredients so the mix would have to be fantastic. When you put chocolate with nuts, you're talking my language. That's why. I am excited to try these, they look amazing and I love almonds! I'm excited to try Fisher Nuts because I love the combo of sweet and salty. im excited because i am aaaalllwaaays looking for healthy snackage! I am excited because I have heard great things and I love snacks that can both taste good and be kind of healthy. I love that it's dark chocolate and healthy. These sound good. I like chocolate and nuts! I love popcorn, nuts and chocolate so this would be a perfect snack for my tastes. I'm pretty sure I've tried these at Costco before. I love dark chocolate. I am excited to try Fisher Nuts Exactly because I love a healthy snack so you can eat what you like to eat, and stay healthy too! The dark chocolate looks fabulous too! I want to try it because it looks like it has simple ingredients which is what I look for in a snack, and it looks very tasty!! I'm excited to try Fisher nuts because it's another snack option for my children. I love almonds and I love chocolate. Perfect combination. I love the idea of the salty and sweet combination! It looks like a yummy snack!Or I would use it in a recipe. I've never seen these before. They sound so good. I will have to look for them in the store. Thank you for sharing.